In turn each player has to think of an object that might be found in the picture on the card, if the scene is a beach then perhaps sandcastle could be a good answer. 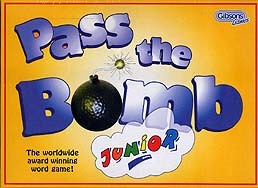 What make this game a hoot is the ticking BOMB which each player passes on after their turn; they have to be quick because nobody knows when the bomb is going to "explode" and if you're holding the bomb when it goes off, you have to keep the card. The player with the least number of cards at the end of the game is the winner.